Hey guys! Today I have a guest post from Shauna of the lovely blog Blushh. If you like this post, definitely go check her out! If you’re interested in guest posting for COOCOO FOR COCO, get in touch! After having piles of books all over my bedroom floor for the past few months, I finally decided that it was about time I did something about it. I rushed to my nearest Ikea store and picked up two of the LACK shelves (link here) and put them up as soon as I got home. At first I added as many books as I could squeeze on, but every time I looked at them there was something just not right about them. I searched Pinterest for inspiration and played around with them until they looked just right, adding things, swapping things around and taking everything off only to start all over again. After doing this a lot, I feel like I’ve finally gotten things right and am very happy with the look of my shelves. Here are a few tips to give you some help styling yours. As you can see from the photographs of my shelves, I’ve gone for pops of colour here and there, but made sure to include both black and white so that everything is pulled together nicely. I personally like having subtle pops of colour on my shelves as the rest of my room is pretty minimal and mostly white, but I also love the look of all white and black, or a combination of different metals/woods. It’s best to stick with a colour scheme that will compliment the rest of your room and that doesn’t look too harsh against the walls that the shelves are on. Whether thats books, book-ends, vases, clocks or photo frames, whatever you’d like, this makes things look a little more interesting that just a row of books. 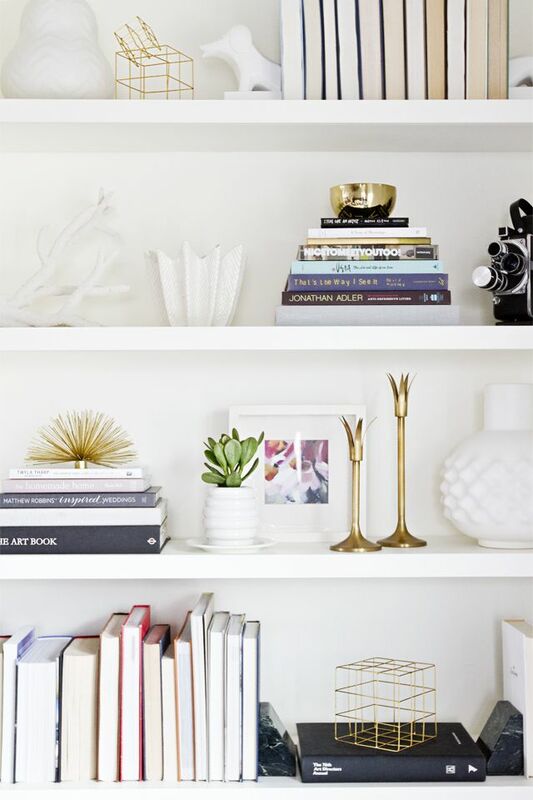 Pinterest is a really great place to go to for inspiration so if your in need of some ideas on how you want your shelves to look then it’s the perfect place to start. Don’t just line your books (or whatever else you’ve decided to put on your shelves), experiment with different ways of organising them to find what looks best. I like to alternate between lining my books horizontally across the shelves and stacking them up with things on top. You’ll probably find that this involves a lot of trial and error so be prepared to move things around until you find what looks best. Check out Shauna’s Pinterest page for more inspiration. Shauna, thank you so much for contributing! Have a great weekend you guys!